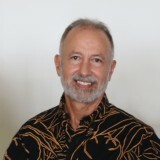 The authors argue Sen. Brian Schatz should get rid of his Chief of Staff Andy Winer, who was a political operative in the successful PRP campaign against Ben Cayetano. PRP’s scurrilous smear campaign against former Gov. Ben Cayetano in the 2012 mayor’s race demeaned and undermined the good will of the entire voting population of Honolulu and, indeed, the state. And PRP’s gray-on-gray, mealy-mouthed “apology” for doing so was a further insult. Fortunately, Cayetano’s attorney Jim Bickerton has uncovered the unscrupulous operative behind it all, Andy Winer. 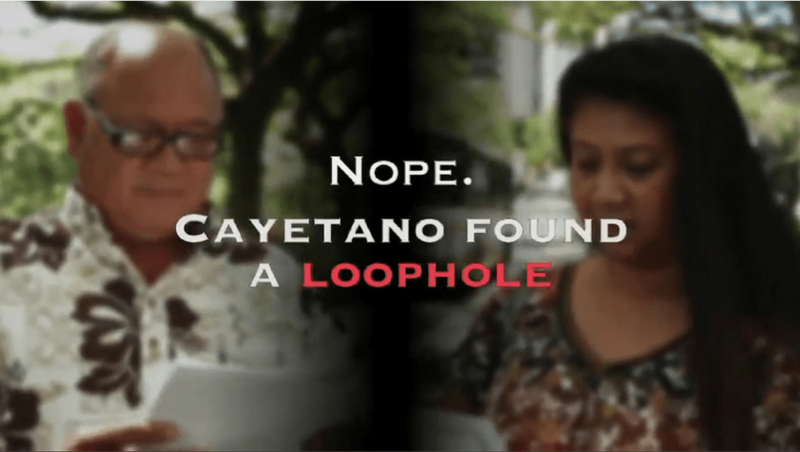 A screen capture of PRP’s loophole commercial during the 2012 Honolulu mayoral campaign that suggested the former governor had schemed to get around campaign fundraising rules. Winer is now chief of staff to Sen. Brian Schatz. As such, Winer is on the government payroll and widely viewed as a representative of our state. His presence in that lucrative and powerful position is demeaning to Hawaii’s population. Schatz should remove Winer. If Schatz declines to do so, Hawaii’s voters should give Schatz an early retirement from the Senate. And PRP should publish a real apology to all of Hawaii’s voters. 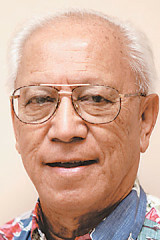 Walter Heen was a state and federal judge, City Councilman, legislator, Office of Hawaiian Affairs trustee, and chairman of the Democratic Party of Hawaii. He was a plaintiff in a lawsuit challenging the process by which the city selected elevated heavy rail.